Fortunately I don't act like the typical American and fill up my calendar with a bunch of ridiculous commitments and end up brain-dead from lack of sleep or overwork or endless repitition of life. And because of that, I'm able to deviate from my forest runs or my ridgetop bike rides and just observe all that is around me with the quizical curiousity of a child (and let's face it...I'm pretty child like in attitude anyway). Oh, yeah, now that's helpful! Seriously, was did the developer just have a twisted sense of humor or was he just very non-creative in naming the streets here. 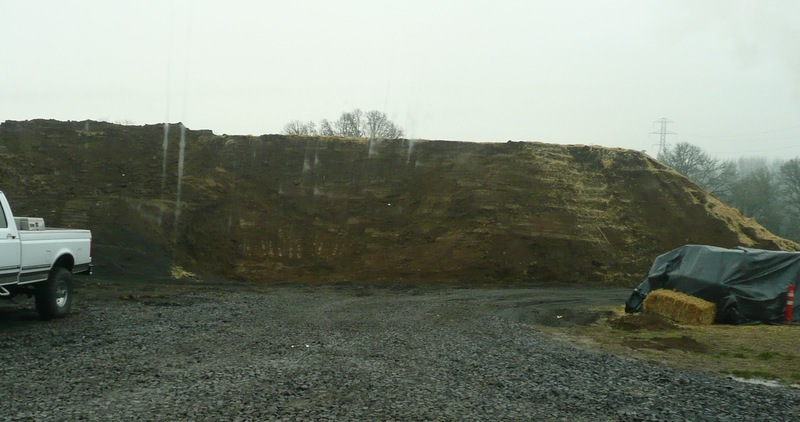 Ok, the story here is that they are building some new houses on this land and they took all this dirt away, spread out hay to keep the ground from getting all muddy, leveled the property, brought in gravel and then proceeded to add this huge pile of dirt onto it. They even had a backhoe sitting on the top of it digging a hole?! WTF? You didn't need to dig a hole if hadn't brought the dirt here in the first place! This is one of those strange older ranch houses that sits defiant of all the sub-divisions and McMansions being build around it. 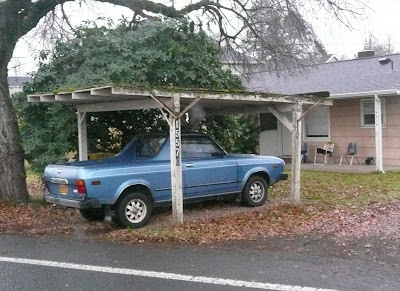 But what makes no sense here is how on Earth a Subaru Brat has survived and is still running to this day. Seriously...it's not even in bad shape. 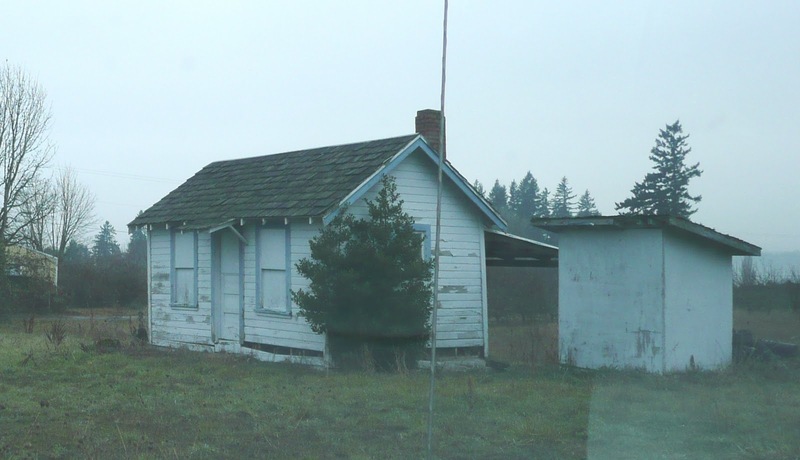 This is some shack that sits next to a field. It makes no sense because this thing would have to be only a single room and no more than 300sf big! And if you think that is small, check out that "garage" next to it! It might fit your scooter. Talk about an open floor plan though. I have to think that you can probably reach from the toilet to the stove to the TV withough moving much (and without even using a remote). No wonder it is boarded up. Hey, riddle me this...why do they need a gate and card reader here? Don't ya think I could just drive around it? And do you think the house was built far enough away? It's not like your entering an estate with a castle built on it. Here's what makes no sense with this. If I have to cut the damn tree...why wouldn't I just do that at 2:00am and save me a bunch of money? Which has me wondering...are these REALLY just water reservours or are they secret missle silos aimed at Russia left over from the cold war? 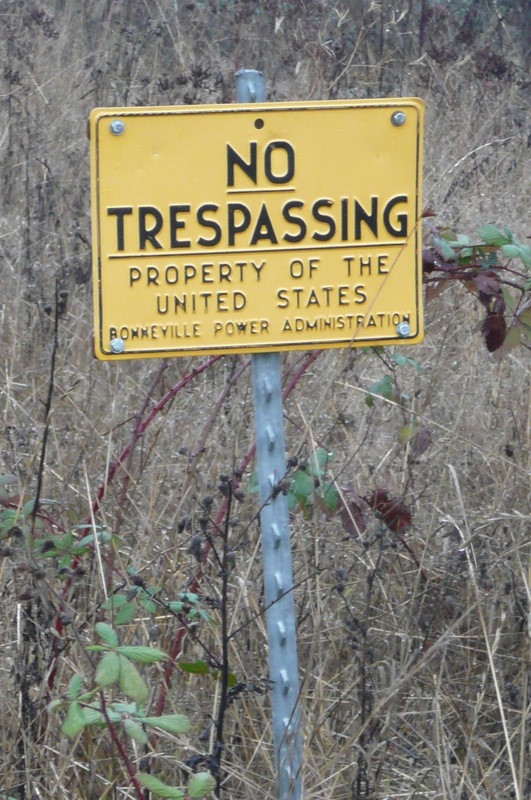 I mean...water reservours in Oregon...the capital of rain...isn't like they should be worried about a hostile takeover or something. Yes...it pays to look around sometimes and admire just how ridiculous things are right next to you! The street signs - wtf?! 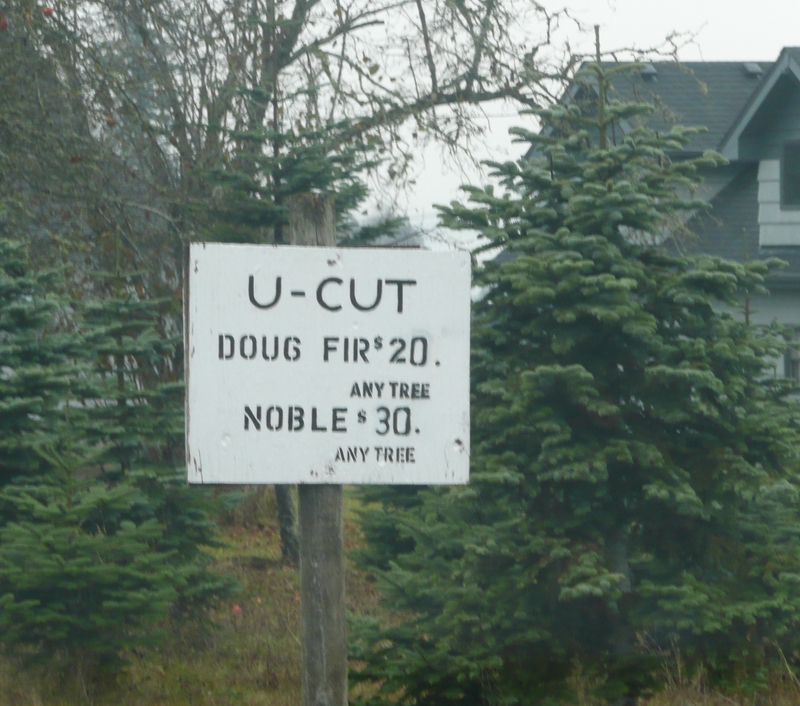 kinda glad my name is not doug...that is a pretty low price on his head...i dunno that small house might be nice...unless you had company you know...smiles. Not sure why the Subaru kept making me dizzy while I was looking at the picture. I just couldn't figure out what was the front and what was the rear of the dang thing. Actually none of the pictures were making any sense. And you know how I feel about our dang gobment and how they are wasting our hard earned tax dollars. Maybe you need to tell those Occupy people to go occupy the fake reservoirs so they could take a bath when they need to. And there is one for the women and one for the men. Plus, maybe the Russians would pay them so they would have a job. 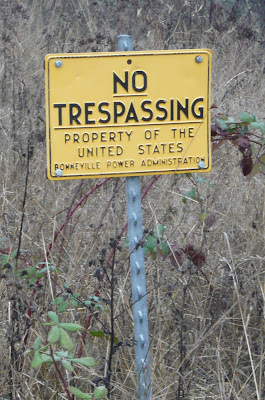 Maybe it was one of them who posted those street signs. Okay, just kidding, well sorta. Oct to Dec, hmm, can only say that you are really missed. Merry Christmas and Happy New Year to you, wifey poo, and offspring. You have an eye for the inane! Seasons Greetings and all that jazz - and post more often! You described me perfectly - brain dead from overwork! I really wasn't meant for this. My true calling is a life of leisure. What makes you think there is a toilet in that shack? I think the folks with the gate and card reader must have spent too much money on the house. They are saving up for the fence. What if I need Deerfield Road? My first time here.Those are very intersting pictures.When you back on reading blogs stop by when you get a minute. Nice collection of weird pics. 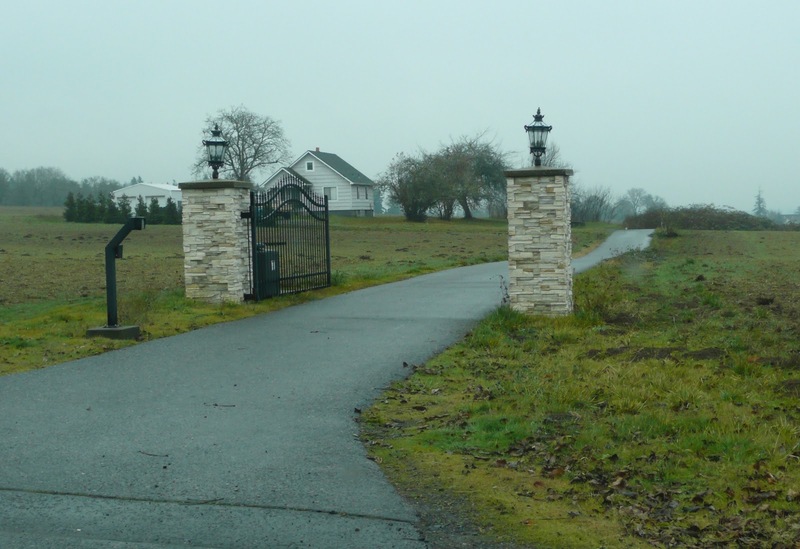 Personally, I think there is an invisible fence at the gate/card reader driveway. I have to laugh at the very small house you see my great grandparents was about that size (maybe even smaller) and they raised 13 children in it. I know my mouth is still hanging open even this many yrs later. In Chicago, our street names change without warning. Travel down Sacramento Ave and suddenly it turns into Humboldt Blvd. Then, three more blocks later it turns back into Sacramento Ave. Pulaski Ave turns into Crawford, then back into pulaski, etc... 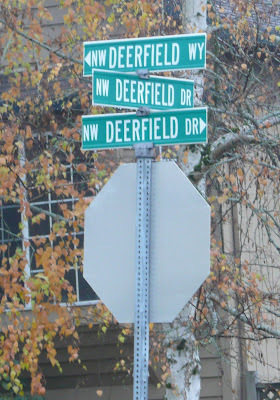 It makes giving directions difficult since you are sometimes not sure what a street is called at a certain intersection! I love the house with the card reader at the gate. Very funny. Sybil law – Who needs a factory to grow weeds? They seem to do just fine in my backyard! Lori browning – It’s tough living the life of leisure knowing there are so many overworkers out there. I’ll drink an extra fruity rum drink in your honor! Kelly – Hurry…I’m taking bookings for 2012 to find inane thinks in your city too! Quirkyloon – Ooh…I didn’t think they could afford the invisible fence. I’ll have go back and put up some invisible graffiti on it…. Arizona – They do a bit of that on the west side of Portland. California is notorious for that technique too. The east side of Portland is gridded out like a Battleship board game with numbers running sequentially West to East and named streets running North to South. I can find any address without a map on that side. definitely a meth house. That card reader has got me curious, any chance you could knock on the door and ask WHY? ?